Jason and I used to make pasta salads all the time during the summer. 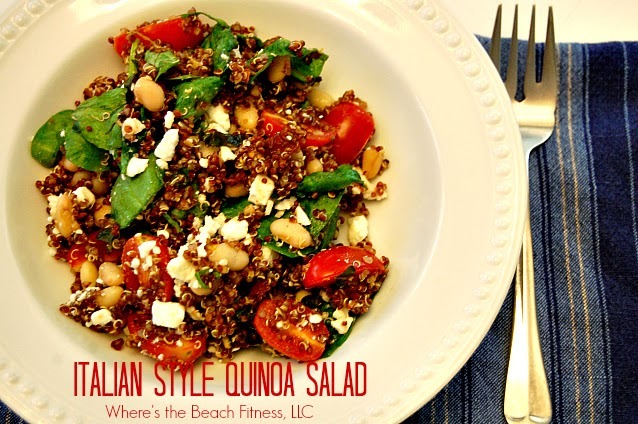 I decided to do a healthier twist on a pasta salad by using quinoa. I had some fresh grape tomatoes on hand and a garden full of basil and oregano, hence the "Italian Style." I'm fairly certain basil and tomatoes were made for each other. I wanted the dressing to be bright and fresh to compliment the fresh herbs and tomatoes, so I used lemon zest and juice to bring out the flavors of the herbs. I also decided to add in re-hydrated sundried tomatoes for an extra tang. This is really easy to put together and would be fantastic to take to a summer picnic or family gathering. You could also serve it as a side dish to a grilled meat or non-meat protein of choice. Combine water and quinoa into a medium saucepan, cover and bring to a boil. Then turn the heat to low and simmer for approximately 20 minutes, or until water has cooked out. Once cooked, add in the minced herbs, salt, black pepper. Meanwhile, in a large bowl, whisk together balsamic vinegar, apple cider vinegar, sundried tomatoes, garlic, salt, lemon pepper spice blend, lemon zest and lemon juice. Add in the beans, diced tomatoes, spinach then add the warm quinoa. Allow the quinoa to begin to wilt the spinach then gently fold to incorporate the dressing into all ingredients. If you want to add feta, be sure to monitor the amount of salt you add then add in the feta after the quinoa has cooled slightly.